Recently we have received several inquiries about the SCD Photo Speed Camera PhotoBlocker Eliminator asking if we knew anything about the product and/or the manufacture. Back in 2006 we tested a similar device that was manufactured in Victoria BC Canada and distributed by Tiger Lilly products, a Colorado LLC owned by John Turner and his daughter Jamie. We obtained a VF2 directly from their company, for our review. We first tested their photo radar jammer using a strobe device and out of over 100 attempts the unit failed to flash even once. We contacted John and he felt that the power transformer was defective so within a few days we received another unit to test. We installed this second unit decided to test the unit against 4 of the Scottsdale photo radar cameras. In each case the unit failed and we post our review of the VF2 photo radar jammer. A few weeks after posting the review of the VF2, we received a telephone call from a customer who read that review and told us that he had purchased a unit and that the transformer of the unit had melted, almost catching his car on fire! The site lists a telephone number of 720-635-3931.This is the same telephone number of 1stRadarDetectors.com website owned and operated by Tiger Lily Products. The SCD Series Speed Camera website’s registrar lists their address on Victoria BC Canada. And here is the biggest kicker!If you went to the the distributor’s website prior to February 9th y you would have seen a photo of a Dodge Viper with a decal “Got Speed?” depicting the SCD Speed Camera in action (as above). This Dodge Viper was rented by Leon Gruner of Blinder USA, Robert Rosania of the Veil Corporation and myself in June of 2005 from a Dodge dealer in Las Vegas for the Speed Measurement Labs radar detector test in El Paso. During the entire time this Viper had this “Got Speed?” decal it never had Mr. Turners NEW SCD photo radar camera jammer installed on it as it wasn’t even yet developed! Would You Spend Your Money On This? 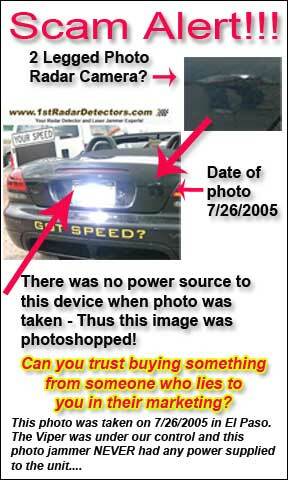 Based upon the out and out lie on Mr. Turner’s website depicting the SCD 2 photo radar camera “in action” on a car which never had the SCD Photo Radar Jammer installed on it, his prior history with the VF2 and having a customer almost losing his car because of a fire that had the VF2 installed, I certainly wouldn’t recommend this device! There was only 1 person that ever came close in making something like this and it was a dentist here in Phoenix. Shortly after we tested the unit and found it to be successful they started installing video cameras along side the photo cameras which of course messed that plan up. is that if you search the web you’ll reveal thousands of results. its twitchy handling and choppy frame rate. This device was priced at about $350 and I decided not to risk purchase, as I was skeptical it worked. I’m glad I didn’t. I was initially checking into because of red light cameras in Oak Ridge, Tn that were taking photos of cars turning right on red and mailing tickets in 2011. I did some research and learned that turning right on red is not against the law in Tennessee. I ignored several ticket mailings from a private company and nothing ever came of it. I understand the red light cameras in Oak Ridge have since been removed but the speed cameras remain, especially around a school zone near the police dept. This approach of using blinding-light countermeasures can have some results with a home-design/implementation. I took an old fog light from one of my previous cars, that had a 55 watt halogen bulb in it, mounted it over the rear license plate of my ’99 Mustang GT. Then I turned it on, took pictures at various intervals with a Nikon D40. It does indeed work to some degree and this was only a 55 watt bulb. Now if you are standing right behind it, it won’t have much of an effect. At distances of say, 20 feet, the photo image begins to blur and at 40 feet and beyond it blurs several of the license plate characters to the point of being indistinguishable-which is the objective. It seems to be more effective at night. The question each driver/hacker must ask themselves is what the distance of the camera is from the photographed vehicle. If it is at least 20 feet or more, you have a valid chance of defeating it. It is by no means automatic. So install a toggle switch on your console somewhere. Anytime you go through a yellow light, just reach down, flip it on as a precaution. Then, once safely through the intersection, flip it back off. If a cop ever asks what it is, either say you don’t know because you bought the car used OR say it’s a backup light and you could not see well while backing up at night. ndThe fog light I used was fairly bulky, round, with a black surround. If you use those fog lights that are narrow, like the edge of a cassette case, it will no doubt be more stealthy. I suggest trying a 100 watt halogen bulb and it might obscure the license plate characters at even less than 20 feet. This approach is cheap and effective. Do not leave it on all the time or the wrong people might see it and start asking questions. Good luck and be safe out there!